Soon after I graduated from pastry school, I got a job at the wonderful 11th Avenue Inn on Capitol Hill in Seattle. It was a dream job, especially coming from being a bottom-of-the-totem-pole pastry cook at a large restaurant. I can’t tell you how much it meant to me to be able to see the faces of the people I cooked for every morning, to talk to them and see they were enjoying my food. Not only that, but I got to plan the menus, do the shopping and order equipment. You know, like an actual, real-live chef. My favorite of that second sort of task was the opportunity to come up with new dishes, which leads us to today’s recipe. (You’ll notice that it’s still on their list of sample breakfasts, although I have to say that I never put papaya on it, mostly because I have yet to meet a papaya I’ve got on with well.) This oatmeal was my star contribution to the breakfast lineup, the only one that really stuck, the only one that it was imperative to leave the recipe behind when I had to leave long before I ever wanted to. At the Inn, there were several discussions about what to call the oatmeal. I have to admit, it was a hard sell every morning I made it. When you say “oatmeal”, most people think of the instant kind that you hide under lots of milk, brown sugar and raisins (if you fall on the pro-raisin side of things). Even qualifying it with “steel-cut” didn’t do much good. This was a few years ago, and steel-cut oatmeal wasn’t on the average American’s radar yet. It needed a good name to recommend it to the uninitiated. This entry was posted in Breakfast, Cooking, Featured and tagged butter, buttermilk, cardamom, cinnamon, cloves, ginger, kiwi, mango, maple syrup, oatmeal, pineapple, pirates, rum, strawberry, tigers, yogurt on March 12, 2009 by Jessica Petersen. 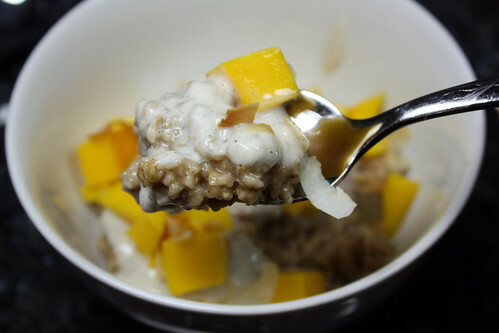 This recipe owes its beginnings to Alton Brown’s Steel Cut Oatmeal recipe, as it evolved after making Alton’s version until I could do it in my sleep. It was created for the breakfast menu at the lovely 11th Avenue Inn in Seattle during my time there. To experience this oatmeal in its full glory (and to see more detailed, illustrated instructions and extra tips and tricks), check out The Tiger’s Oatmeal, which is served with cardamom yogurt, toasted coconut flakes and tropical fruit. This entry was posted in Breakfast, Cooking, Recipes and tagged Breakfast, butter, buttermilk, cardamom, cinnamon, cloves, ginger, oatmeal, rum on March 12, 2009 by Jessica Petersen.